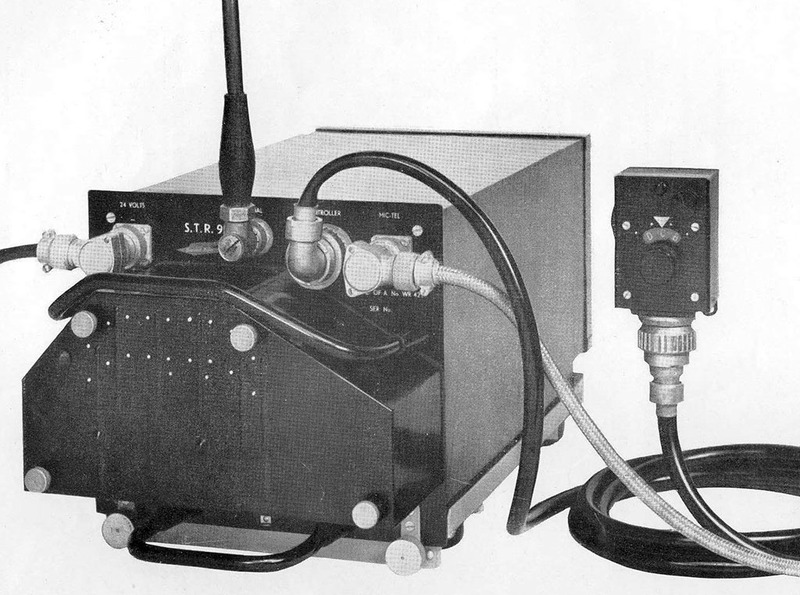 This equipment, operating in the aircraft AM band from around 100MHz to 125MHz, was used in aircraft like the English Electric Canberra for air-ground communications. It would have been the type of set that the last of the R1392 control tower receivers would have picked up. It represents the sort of lengths that designers had to resort to without the benefit of synthesised tuners, varactor diodes and broadband amplifiers. Nowadays a pilot has to merely flick a few switches and a transmitter or receiver will be ready for use without the requirement for mechanical aids. 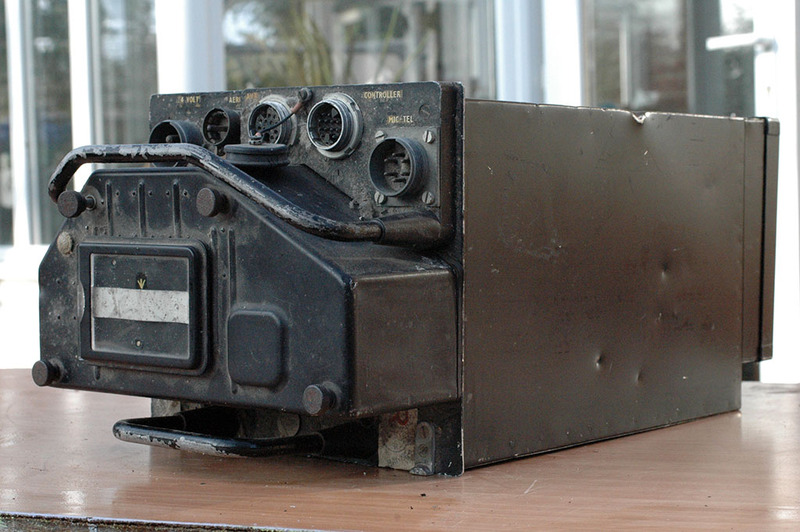 Side view showing the dynamotor. 24 volts input, 250 volts and neg 50 volts output. 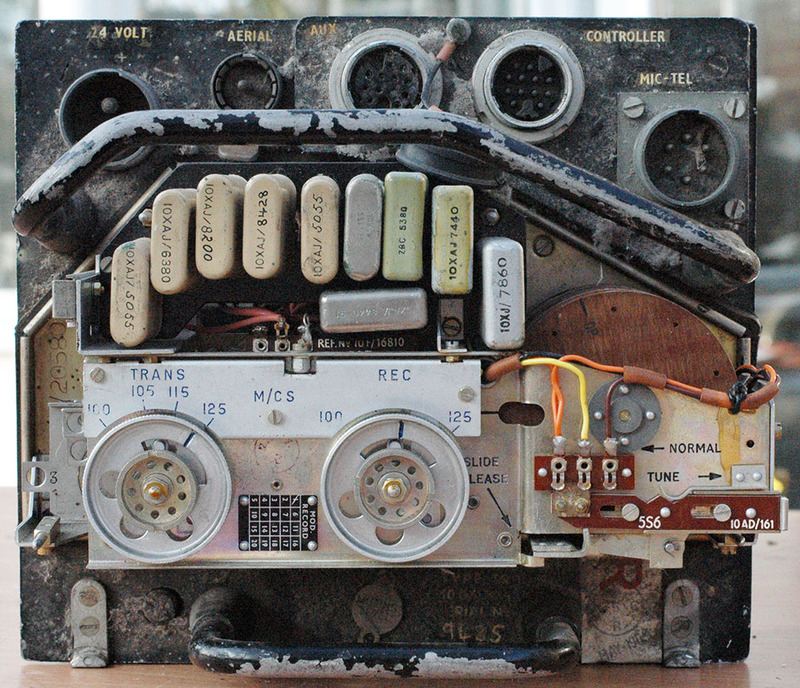 The opposite side showing the transmitter module with its B9G QV04-7 driver and TT15 PA. Carbon pile trimmer control on the left side. 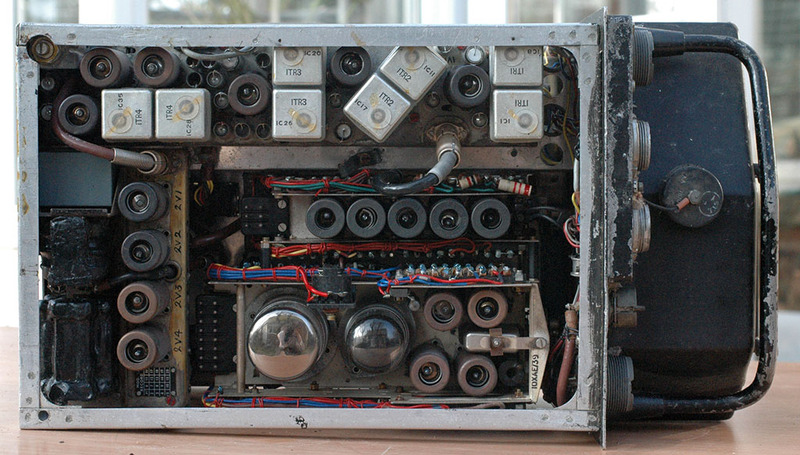 Top view showing the various plug-in modules. 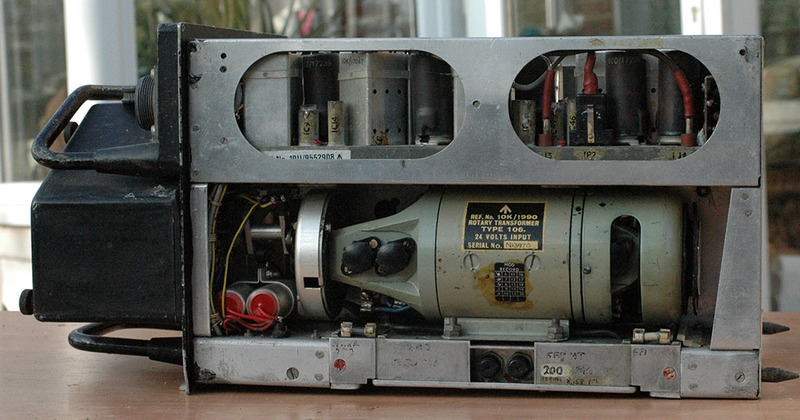 Bottom view showing the trimmers for the transmitter and receiver; aerial relay on left. The diecast box covers dynamotor circuitry. Front view with cover removed showing a complete set of crystals. Were these being used immediately before the set was demobbed? A closer view followed by a table listing the frequencies in use, some of which are very odd if my calculations are correct? The oscillator multiplier output of x9 is added to a crystal oscillator output of 4.86MHz and the result multiplied by two to derive the transmit frequency. Can anyone explain the odd results in the above table? Is it possible one of the two multipliers is working at x2, x3 or x4 depending on the crystal frequency? Or is it simply that the last owner plugged in a set of crystals at random and only two were valid, as the manufacturer specified for the TR1985, a range of 5015 to 6404KHz? Higher frequency variants used crystals up to 8126.67KHz. The TR1985 was tuned from a remote control box... giving the impression that it was a simple matter to change frequency. However it required the benefit of a motor driven set of levers and switches to achieve the end result. Firstly a crystal, cut for the particular selected frequency, has to be selected, secondly the tuning capacitor for the receiver front-end and heterodyne oscillator had to be adjusted and thirdly the corresponding tuning capacitor in the transmitter needed adjustment. All the necessary mechanical settings were made at the time a new crystal was plugged in. By a clever clutch and gearbox arrangement the work of tuning and switching was carried out by the same dynamotor used for the HT and grid bias supplies to the tx and rx. This brings me to another of the disadvantages of equipment used in the early days of the cold war. 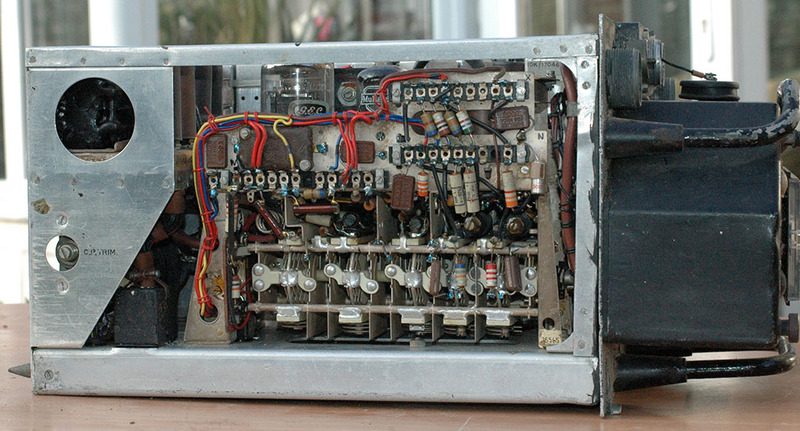 Not having the benefit of transistors, the 21 valves needed a sizeable power input just to get them up to temperature so they'd work. They would then demand high voltages for their anode and screen supplies. The inefficiency of a set such as the TR1985 was considerable, not to mention the weight. If numbers mean more to you then how about 210 watts input to provide 4 watts of RF output and it weighed in at around 25 pounds or nearly 12kgm. Another problem of course, concerning equipments of the valve era, was reliability. Valves have a finite life and with a collection of 21 of the pesky blighters, it wouldn't be long before emissions would start dropping off, demanding a visit to the workshop for servicing. A hidden bonus is that repeated visits for servicing allowed modifications to be made. This set carries a mod plate with 18 of its 25 struck off, no doubt reflecting design improvements, changes to specification and the fitting of alternative components etc. 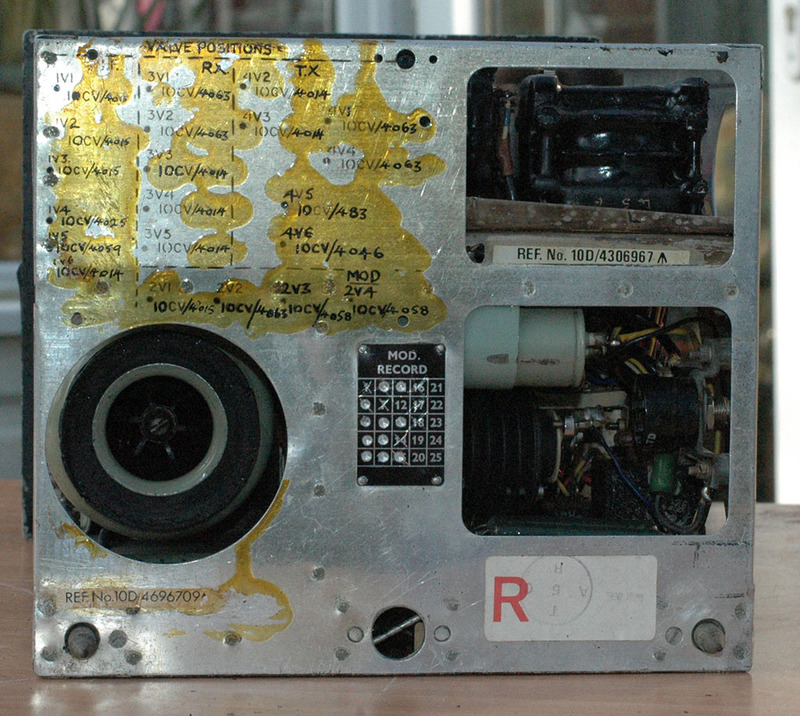 The only date stamp visible (on the rear of the chassis) is "Sept 1980". Is this the date it was finally stood down or does the adjacent red "R" merely mean it had been further repaired and put back into service? The outer case is made from aluminium and the framework inside from the same material. The various demountable chassis are quite heavy, being made from brass, plated with what looks like cadmium. Considerable effort has been made to aid the servicemen by giving all the units plug and socket connections, allowing replacement in the event of damage or failure. Worth a mention is the regulator for the valve heaters. This is a carbon pile regulator and its principle dates back to the earliest days of electric lighting. In the days before high power tungsten or carbon filament lamps a carbon arc was used in places like theatres. The difficult part of using a carbon arc was dealing with electrode wear so a solenoid regulator was developed which used current consumed by the lamp to set the relative position of the carbon electrodes. More current pulled the arc apart and less let the carbons move closer together, thus maintaining a constant light output as the electrodes were used up. The principle of the carbon pile regulator is similar. You adjust the current through the valve heater circuit by setting a current through a solenoid which is mechanically coupled to the carbon pile and having done this any increase in voltage will release pressure on the carbon sections making up the pile, increasing their resistance. A decrease in voltage will press the carbon pile sections together thus reducing their overall resistance. In this way the 26 volt input voltage from the aircrafts power unit will not over-run the valve heaters if it were to rise and vice versa. Valve heaters are arranged in three parallel groups wired in series requiring 3 x 6.3 volts or 18.9 volts. The regulator must therefore drop a nominal 24-18.9 volts or 5.1 volts. 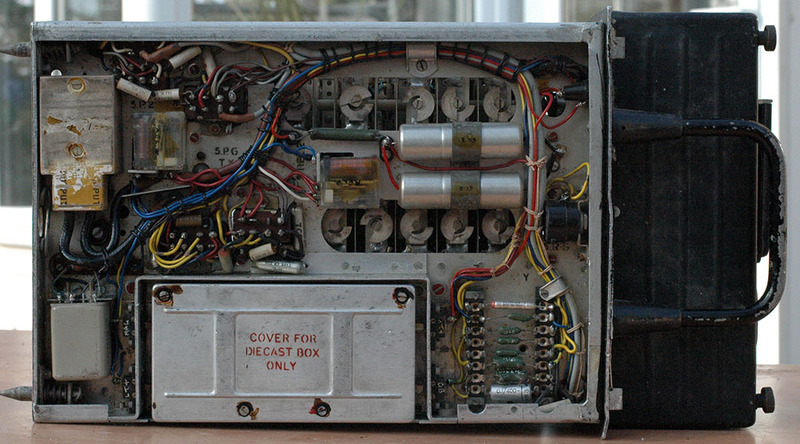 In the early 60s these equipments provided an easy way for radio amateurs to sample the delights of operating on the 2-meter band and I recall with pleasure having many hundreds of QSOs using the transmitter section (left) of one of these TR1985s, suitably tweaked and crystalled for the 144-146MHz band. 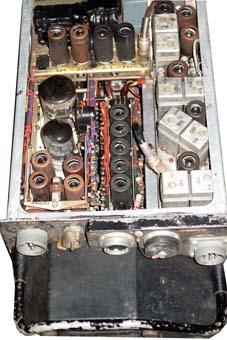 The PA valve is rated at 25watts, and using AM, provided quite a potent signal. In those days (the 1950s and 60s) most amateurs used AM on 2 metres using one or more crystals for their transmitter. A typical receiver would be the shack's HF receiver tuning say 24 to 26 MHz with a 2 metre nuvistor converter plugged into the aerial socket. Contacts were made by transmitting on your favourite frequency and indicating you were tuning high to low or whatever for a reply. A smart operator returning the call would plug in the appropriate crystal to be heard first. Having made contact you would retire to the back garden with the receiver volume turned up and swing your aerial round to get the best reception. Nowadays VHF operation is much like using a telephone.